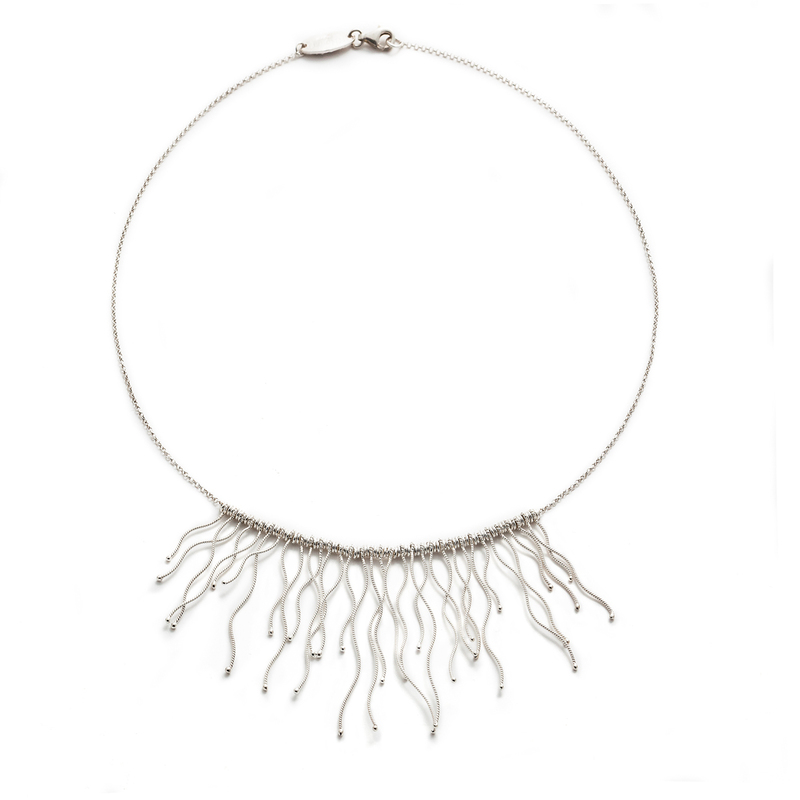 Silver necklace with small hand-made filigree snake-shaped elements, of various lengths and shapes that give the gem elegance and lightness. Silver and fabric pendant. 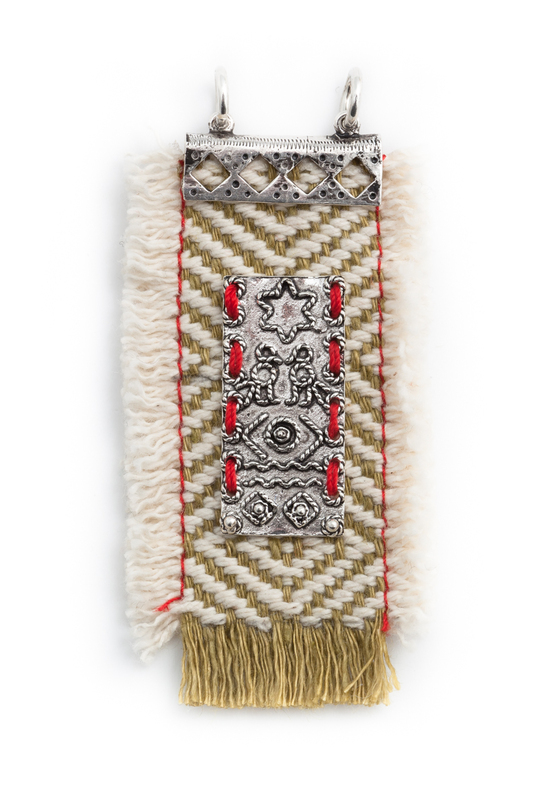 The jewel includes elements made of the typical fabric used for saddlebags, and a central silver element crafted with the fusion technique, decorated with tiny motifs. Silver and fabric bracelet. The jewel includes elements made of the typical fabric used for saddlebags, and silver elements crafted with the fusion technique. It is part of the Terlarzu collection that combines traditional goldsmith's art textile production. 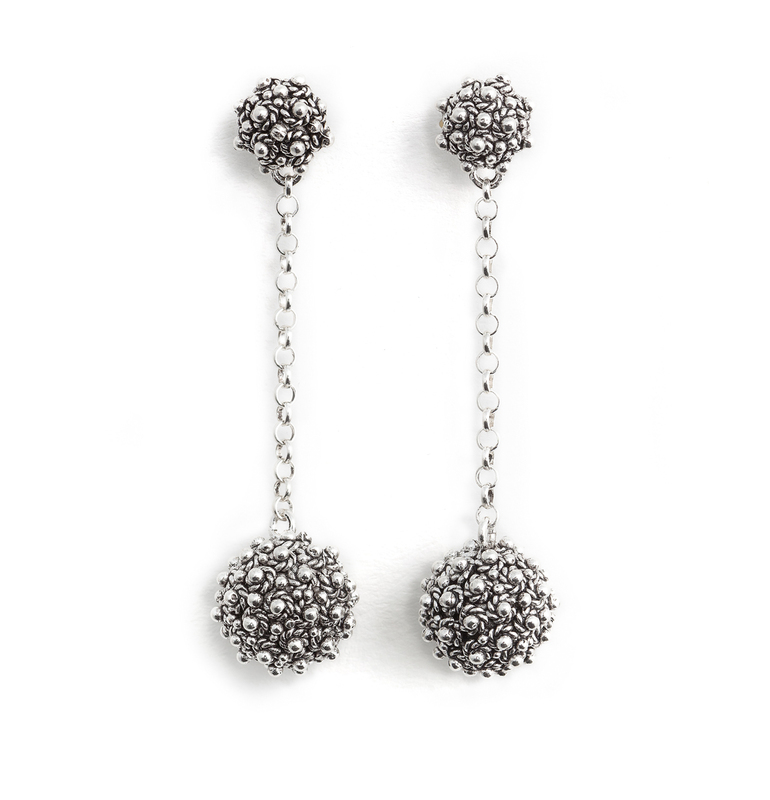 Honeycomb wrought silver earring, fusion technique, consisting of two small balls of different sizes, joined by small chains. 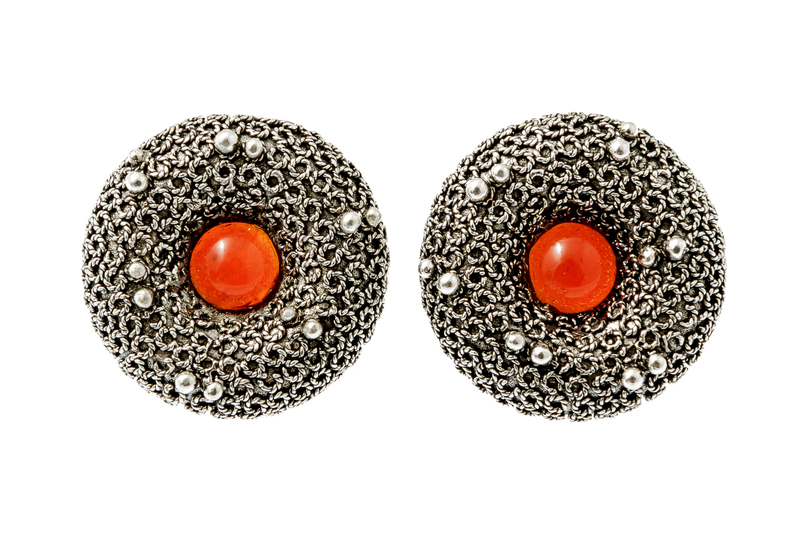 The perfect circular shapes of these elegant silver earrings are emphasised by the refined relief effect and the warm amber colour of the central carnelian. They are part of the Ciambella collection inspired by and dedicated to the evocative local traditional confectionery. RR Orafi was founded in 1983 in Sassari by Riccardo Dessì and Rocco Onnis. The two Sassari-born partners (and schoolfellows since primary school) started to work in 1977 at the workshop owned by Riccardo's father, pursuing a tradition carried out by three generations of jewellers. Two years later, in 1980, they moved to Valenza Po, one of the most important hubs of European goldsmith's art, to learn crafting techniques different from the traditional Sardinian ones, collaborating with goldsmith masters in several workshops. These experiences resulted in an original collection inspired by traditional craftsmanship, but modified and with a more contemporary touch. The production is varied and includes sophisticated jewels inspired by goldsmith traditions used by millenium-old Mediterranean cultures, reinterpreted in a more contemporary style. They are the result of a non-stop research and experimentation. The goldsmith workshop crafts 750 gold and 925 silver jewels with precious, semi-precious stones, and other materials, such as textiles and wood. The different types of work and the combinations of jewels give birth to jewel collection that include a large variety of rings, bracelets, brooches and earrings. The typical jewel finishes are the result of an entirely hand-made craftsman's production, during all its stages, from design to finish. Traditional goldsmith's techniques are combined with more classic techniques. The jewels crafted often feature more than one technique, including fully hand-made filigree. RR Orafi crafts jewels using 925 silver Sardinia filigree, crafted both manually and using lost wax casting and galvanic burnishing and gilding.